Grandpa, yu noh dey tire? That magu, mugu abi na magun is a f00l. Why did they go to school in d 1st place. Law can be twisting, u need enough balls and brains to untwist it. D naija constitution stipulates that no one is guilty until proven otherwise by a competent court of law. Dat mumu can aswell bear himselfwitness that ever since he started growing up as a child that he has not seen where an innocent man/woman is being accused wrongly. Lawyers are created to prove the wrongly accused innocent( I am not saying that those politicians are innocent). So, instead of this man to be lamenting, he should build a strong case with enough evidence which will put those lawyers defending the criminal into shame and ridicle, if he has not been doing that, then he is not doing his job. He thinks he can just convict anyone using media propaganda? Or intimidation? (forceful detention and torture to get a confessional statement? Bring the evidence to nail them, that is what d constitution said. And u can not abide by the constitution, then u are a criminal yourself. Wailing IPOD, I hail ooo. Magu is an ignorant skunk. That is exactly why they are trained to do. Defend irrespective of the offence, an accused remains innocent until proven guilty. na their sauce of livelihood be dat. Se make lawyers no collect their share of the National cake abi. Well that makes him the right man for the job. Someone out for vengeance will be difficult to compromise. We need these monies back. So you have already found them all guilty as charged without trial ? Jesus!!! !It is only in nigeria that this will happen....One day you will be in their shoe i pray. I have seen a man spending 20 years in jail because his lawyer did not do good job not because he is guilty..
What's this one saying? So lawyers shouldnt practise their profession at a time litigation seems to be the only thriving thing in this choking economy? produce petitions with evidences against these people first then u can wail if nothing done. Why did GEJ not carry out prosecution of tinubu & others if he s sincere n just. Let magu & pmb be pls. ...dumb homebase eddddiot....Inosent until proven Guilty by law!!!! Ogbeni, wetin be your own, na you go try get better lawyers. The lawyers defending them no go chop? when will these dreams be reality? Bia nwoke what is your problem? To be very serious and honest are you saying you dont see anything good or positive in this administration? 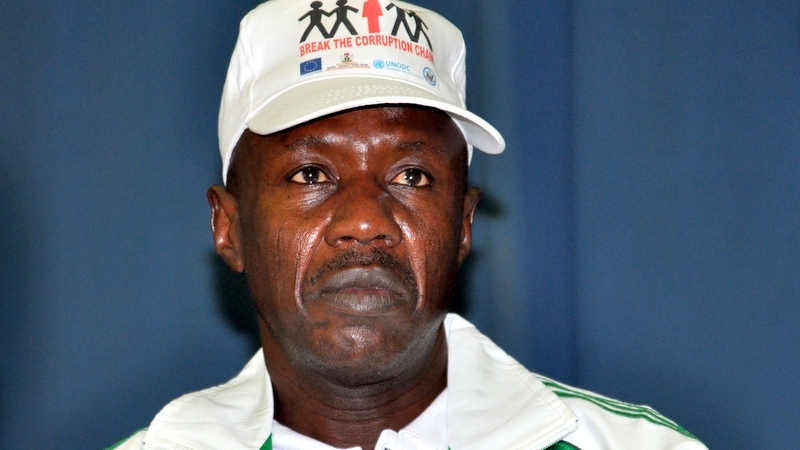 Name smearing campaign, dat's what u are doing there magu. U did tell us dat somebody ate statement. U labelled him a goat eating corrupt man whr as he is a gentleman. somebody's father n husband, u brought him to court on handcuff and u say d lawyers shouldn't defend such malign. Magu has gone bananas. Telling us the money recovered has being put in fg.account is unacceptable coz u cannot be publicizing the said looters on the media without giving us the true owners of the money monthly breakdown of wat u recover every month..
Leave them let continue to shild them by 2019 when they are voted out they will answer for their crimes, these two men are worse than Dasuki, we came hailing them. When you announce all the moves and arrest your about to make on newspapers. cos u dnt hav enough evidence, dnt jst act base on only informations...gather enough evidence b4 u act. EFCC should get very intelligent lawyers to help them as prosecutors... as simple as that. That is what a lot of "devil" lawyers do in other countries also... they defend murderers and rapists knowing that they are guilty. have you watched the film devil's advocate staring Keanu Reeves (the guy from the Matrix movie)?